Concrete Data partnered with PortCall.com to build a scheduling and tracking application for commercial seaports. 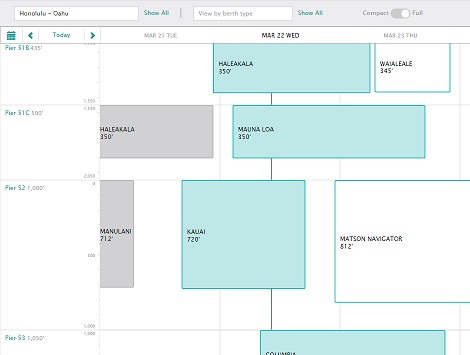 PortCall schedules every commercial vessel that calls at one of the nine ports in Hawaii. Concrete Data’s visualization tools allow port managers to optimize schedules and allocate resources effectively. Optimized schedules reduce vessel wait times, reduce fuel consumption and improve the utilization of costly assets. One of the most challenging aspects of managing a modern seaport is communicating changes rapidly to all affected parties. Vessel schedules can be changed by weather, congestion, mechanical issues, cargo operations, availability of shore-side resources, and many more factors. PortCall enables collaboration and rapid communication between all parties in a port. Harbormasters, vessel masters and agents, pilots, tug operators, stevedores, land-side transportation and other participants use PortCall to understand the impact of schedule changes and adapt their operations accordingly. 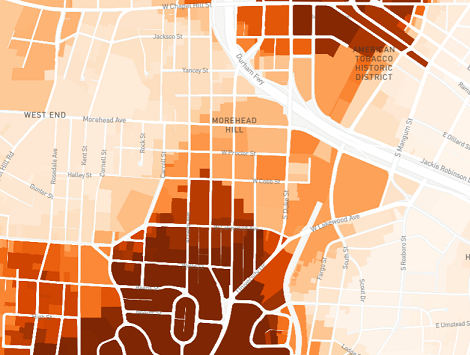 Concrete Data built a web-based visualization tool to illustrate shifts in housing prices in Durham County, NC. The city of Durham is experiencing rapid redevelopment of its downtown area, and relative value in the real estate market has been shifting from outlying areas of the city and county toward the center. At the same time, historically lower-cost neighborhoods have experienced rapid acceleration in renovations and new residential construction, creating rapid changes in house prices. We used public GIS data and real estate sales information to provide a visual illustration of these trends. Concrete Data worked with the University of North Carolina to add financial management features to an existing web application tracking construction projects. 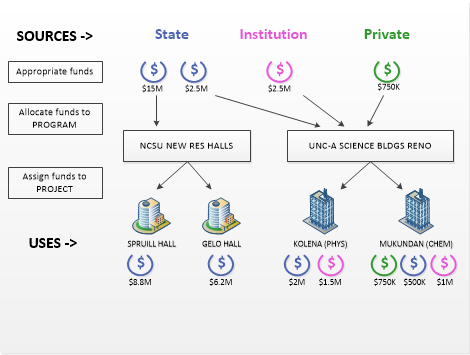 The new features enable each UNC campus to track the flows of capital funds from their sources – whether State or Federal appropriations, internally generated revenues, local government support, or private funds – to their eventual uses. These features replaced multiple older systems and provided management reporting and transparency that had previously been very labor-intensive to obtain. The resulting application was deployed at all 17 UNC system institutions, the 60+ campuses of the North Carolina community college system, and several of the departments of North Carolina state government. This application tracks hundreds of millions of dollars of capital construction funds each year. Concrete Data worked with the City of Durham, NC Department of Public Works to build a web-based contract administration and progress reporting application, PDRX, to manage the City’s public works construction contracts. 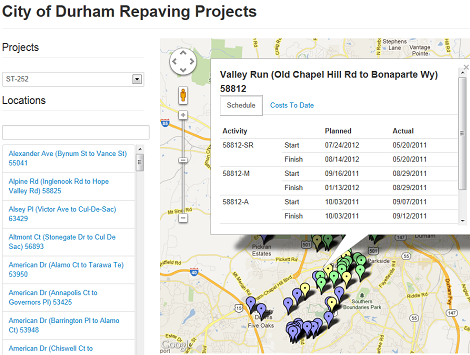 PDRX provides workflow tools for contracting firms to record, and for City inspectors to review, the progress of work. PDRX combines approved daily reports into monthly progress payment applications, using the industry-standard AIA G702/703 computations. Management analytics enable the City’s staff to identify budget and schedule variances at an early stage. PDRX is integrated with the City’s Primavera P6 project scheduling software. 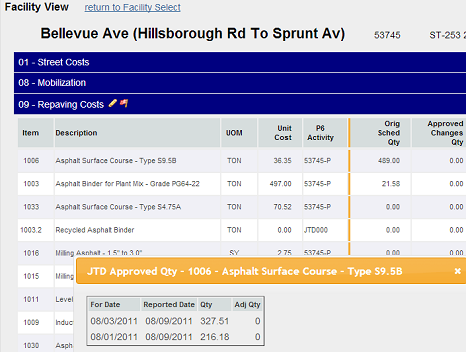 The software has been in continuous use since 2009 and has managed over $300M in capital construction projects. Concrete Data built a suite of cross-platform tools for mobile data capture, used by customers in industries as diverse as agricultural technology, home health care delivery, and municipal public transit. 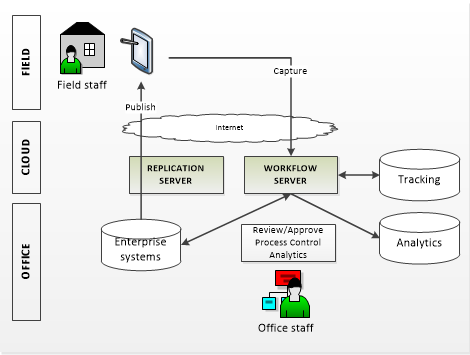 These tools enable business users to create offline-capable mobile apps that capture data from field workers, synchronize mobile data with enterprise server applications, and provide seamless workflow integration for office-based and remote workers. The mobile tools include a hybrid mobile app for iOS, Android and Windows Mobile devices, a data replication solution to make enterprise data available even to offline devices, and a form design tool. Non-developers use these tools to create powerful mobile forms to capture inspection results, the results of field trials, patient encounters, and more. Concrete Data has worked with construction contractors, public utilities and defense contractors to implement project controls solutions for multi-million dollar projects. Many of these solutions are based on Oracle Primavera P6. We are experienced at integrating accounting and scheduling systems to provide project controls professionals with consolidated views of progress against cost, time and work completion benchmarks. We also integrate project-tracking systems with GIS and asset-management applications to enable geospatial analysis and visualization applications. Integrated solutions for project controls enable earned-value reporting, cash flow forecasting, portfolio-level resource planning, geospatial analysis, and more. Concrete Data can help your organization implement an integrated project controls environment. In partnership with researchers at a startup company, Concrete Data built a prototype optical device that used interferometry to measure properties of biological samples. The device design required extremely precise timing, so we implemented custom real-time software running on a dedicated Beaglebone Linux system. Our solution was able to control the optical device with microsecond precision. 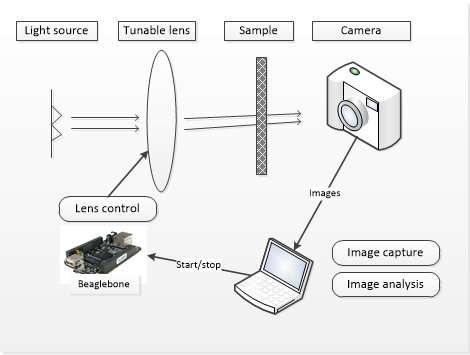 A host computer sent launch instructions to the Beaglebone and captured the images coming from a high-performance camera for subsequent analysis. We’re experienced with writing code that must run with highly predictable timing, that runs on or interacts with embedded systems, and that gathers large volumes of data for analysis.